The serve is the first opportunity to score in the game of volleyball. In rally scoring a serve that does not make it over the net or is out of bounds is an immediate point score for the serve receiving team. Out of bounds or into the net serves during side-out scoring shifts the serve opportunity to the other team. The main goal of the serve is to hamper or to defeat the receiving team’s ability to follow through with an effective return attack. A serve that strikes the ground within the court boundary lines is referred to as an ace serve. This often happens when receivers cannot decide who will pass the ball or if there is a misjudgment on whether the ball will be in bounds or out of bounds. A mishandled pass on a serve receive that can’t be recovered or kept in play is also considered an ace serve. The most popular serving styles can be categorized as a variation of either a float or top spin serve. Listed below are some of the most common indoor and outdoor volleyball serving styles in use today globally as well as general tips and suggestions on how to serve a volleyball. For younger players who are still developing the shoulder motion and arm strength needed to serve overhand, the underhand serve is a good stepping stone towards that effort. If you’re right-handed, the ball is typically held in your left hand out and in front of your body around waist height. The right arm swings towards the hand holding the ball in a pendulum motion starting from slightly behind the lower back then moving forward towards where the ball is being held by the other hand. 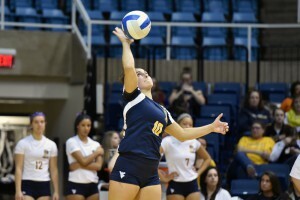 Instead of a toss, the motion for the hand holding the ball should be more of a release right before the ball is impacted by the dominant hand in an upward motion towards the direction of the net. 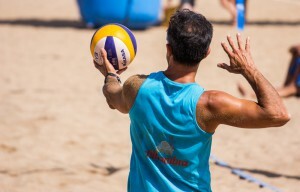 A horizontal fist, where the back of the hand is facing down and fisted fingers are facing up or open hand typically offers better control of the volleyball’s trajectory as opposed to the hammer fist. An open hand impact provides greater volleyball surface area to hand contact which usually results in better overall ball control. A hammer fisted contact with the ball provides the least amount of volleyball surface contact and therefore the least amount of control. A variation of the underhand serve that can still be seen in use outdoors is the underhanded sky ball serve. The sky ball serve starts with a hand held release of the ball as it is pounded upward from underneath by either a fist or open hand with as much strength as possible in order to send the ball as high as possible over the net. This serve can be really effective if the sun is directly overhead or if there is a slight wind to move the ball erratically left and right as it descends. The idea is to make it as difficult as possible for the receiving team to track the descent of the ball and therefore increase the likelihood of a bad pass. The idea behind the float serve is to strike the ball with the flat of an open hand in a manner that produces no spin on the ball as it travels over the net to the receiving team. A non-spinning volleyball tends to move in an unpredictable manner increasing the difficulty of the serve and the effort needed by the receiver to accurately assess, receive and pass the ball. The server stance may vary according to player preference. Some players prefer to stand balanced with feet shoulder width apart utilizing a forward stepping motion when serving while other players stand with one foot already forward and one foot back. The hand opposite the arm that will be impacting the ball provides the toss. For a float serve, the toss should go high enough and slightly out in front of the serving shoulder for the swinging arm to be fully extended when impacting the ball. The motion of the arm swing should be comparable to shooting an arrow from a bow. With the elbow back, the forearm portion of the arm swings up, pulls back above the head right after the toss then springs forward striking the ball at the point where it is stopped in the air and on its way back down. The open hand should strike the ball at its center with no movement of the wrist to avoid creating any spin on the ball. 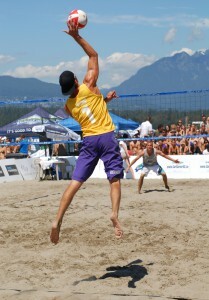 The marks of float serve can be seen in its trajectory. If impacted correctly, the non-spinning ball will often appear to bob and weave left, right, up and down as it soars over the net. The top spin serve uses the serving form of the float serve with the addition of wrist snap to create spin on the ball. The top spin serve is most effective when the entire hand is able to wrap around the ball on impact generating as much hand and finger rotation as possible. The spin on the ball causes it to descend rapidly as it travels over the net. Top and side spin can be added to the ball simultaneously by adjusting where the hand impacts the ball resulting in a curve ball style serve that drops rapidly and curves at the same time. With increased popularity both indoors and outdoors, the jump serve has become a desired skill for volleyball players at all levels of the game. 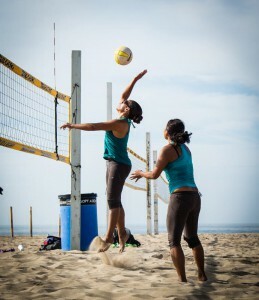 The key elements of the jump serve include the toss, footwork, jump and timing of the hand to ball contact. The toss should be higher up and further out to accommodate stepping forward and jumping. The footwork should be similar to attacking at the net which is typically a 2 step approach. If you swing with your right arm then your approach would normally start with the left foot back. After the toss, step forward with your left foot then hop and jump from 2 feet with arms swinging up towards the tossed ball. If the timing is correct, your swinging arm and hand should contact the ball at the point right before it begins to descend. At this point, players have the option of floating the ball or putting top spin on it. When the ball is floated or impacted with a flat hand, it is often called a jump-floater. Beginners should focus primarily on the toss, footwork and ball contact timing by only catching the ball when first learning to jump serve. Once these jump serve staging elements have been developed sufficiently then catching can progress to arm swing attack development. One of the best strategies in serving is the ability to mask your intention by remaining consistent in your form right before impacting the ball. Or in other words, use the same stance and arm swing for both float and top spin serves. The idea is to make it difficult for the receiving team to predict the serve type or trajectory. Where the ball is served can help reduce the opposing teams attack options, making their return response more predictable. For example, if you serve a ball that drops within the 5 foot line on the opposing side then the front row middle blocker or other front row player may be forced to pass the ball therefore reducing the probability that he or she will be ready as an attack option for the setter. Accurate deep corner serving is another strategy that has the potential to force receiving players to move to the ball. Having to move to where the ball is descending increases the pass difficulty level and increases the likelihood of a less than accurate pass.